The 2008 Limited Edition Boxster and Boxster S are priced at $49,000 USD and $59,900 USD respectively. Only 500 of the Limited Edition Boxster and Boxster S models will be made available throughout US and Canada on September 28, 2007. Sophisticated airbag safety comes standard on both Boxster models. Two full-size Advanced Airbags in front offer optimum upper-body protection, even with the top down. A weight sensor in the passenger seat automatically switches this airbag off when the seat is unoccupied or fitted with a child seat. Add to that standard 18-inch black alloy wheels (19-inch for the Boxster S) and additional black trim pieces on the exterior, and you’ve got a fairly stunning exterior package that overshadows a garden variety Porsche Boxster with ease. The idea of locating a compact, freerevving engine midship gave the Porsche a nimbleness no sports car had ever possessed. The Boxster shares this boldly intelligent approach to sports car design. Active electronic driver aids profoundly enhance the everyday driving stability of a Porsche. Porsche Active Suspension Management (PASM) switches to Sport mode, altering its baseline damping force for considerably firmer shock response, enabling faster turn-in as well as better road-holding and traction. 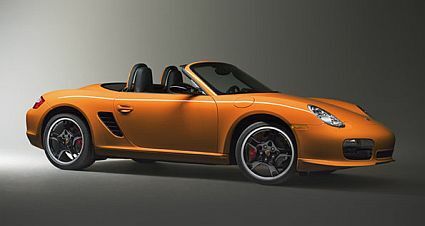 The Limited Edition Boxster and Boxster are to be clad in a stunning orange paint which was previously featured in the track-ready Porsche 911 GT3 TS. The Limited Edition Boxster is an impressive piece of work that includes a special “Limited Edition” plaque on the glove compartment. And that’s not all! Even the gray shift pattern on the gear shift lever was also tinted with orange.